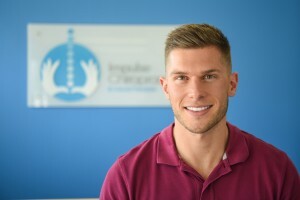 Did you know that Impulse Chiropractor James Kerr is also a certified personal trainer? Functional movement training: Training that focuses on optimising mobility and stability of the musculoskeletal system. Improving and enhancing movements that are specific for your day to day life and/or sport. Injury rehabilitation and management training: Training to help you recover and manage acute and chronic injuries. High Intensity Interval Training (HIIT): This is a cardiovascular based workout that involves combining a series of medium/high intensity exercises separated by short breaks in a circuit format. HIIT sessions are tailored to your level of fitness and ability as well as your goals. Seniors training: Specific and guided training that focuses on maintaining mobility, stability and strength in key areas that are subject to the wear and tear of ageing. Boxing: 1 vs 1 or small group boxing sessions are a fun and unique way to train the whole body and improve your aerobic fitness! Sessions are held in North Curl Curl at Surf Reserve and John Fischer Park as well as Mona Vale throughout the week. If you’re interested in training with James or would like to know more information please feel free to get in contact!